While downloading photos from my camera I was not surprised to find that I’d taken zero pictures in Bend. Bend was, to me, like nonfat plain yogurt: something you buy because you think you should. Then, because it lacks any obvious appeal, you let it lay moldering in the back of your refrigerator and eventually throw it away. Bend left the same impression. First it was nondescript. Then it evolved into an irritating place: semi-desert (I don’t like the desert), weird downtown, sterile neighborhoods and a terrible place to run. Let’s move on. Edited: I just realized that I’ve already forgotten the sequence of places we visited. Bend was, in fact, before Eugene (covered in an earlier post). I guess Bend annoyed me so much that I had to take yet another swipe at it. The next stop after Eugene was Corvallis, a place we had no preconceptions about and no expectations of. What a pleasant surprise Corvallis turned out to be! Lovely weather and scenery (it’s in the Willamette Valley, in the heart of the wine country, and rural), cute town, exceedingly friendly people, nice downtown to wander around, and pretty good running. We did a run that started out just a few blocks from downtown and within about 10 minutes we were running with an audience of cows. It reminded me a lot of running in Iowa. Corvallis is distinguished as having one of the most concentrated collections of highly educated people in the country among its citizenry. Oregon State University students make up nearly half the population (20,000 out of about 50,000), and obviously university professors, adjuncts and other academic types make up a large part of the population as well. The people who ran our B&B (Harrison House — excellent place to stay) were both former academics. Yet it (and its people) were approachable and exuding a warm, relaxed vibe. We really liked Corvallis and were sorry to leave. But leave we did, to make our way to Mt. Hood. 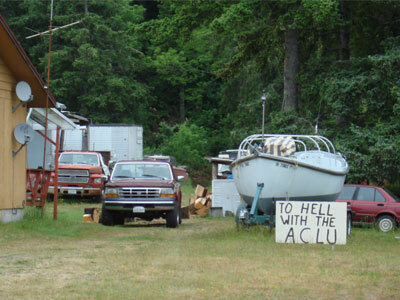 But not before a stay overnight in Troutdale. About the only thing to recommend Troutdale is the fact that there is a McMenamins Hotel there. The rest of it is a dump. We attempted to run there (actually, we did run, but suffered through every step). It was horrible. We spent most of the time running in a bike lane or on concrete sidewalks, with heavy 40-50mph traffic roaring by us mere feet away. 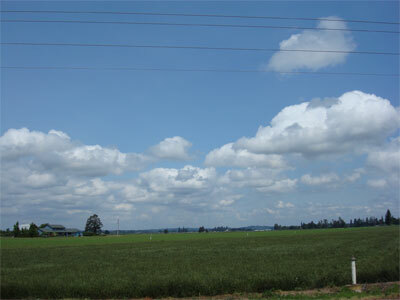 It was also hot, humid and windy. And, to top things off, our lungs were burning from the plane exhaust, as Troutdale is in the flightpath of not one but two airports. I imagine that if you run there for more than a few months you’ll probably suffer from hearing loss and respiratory health problems. For those not unfamiliar with McMenamins, they are a chain of hotels around Oregon (and I think they may be in WA too, but I’m too lazy to look). They are also a brewery. Their hotels are more like mini resorts, little compounds typically consisting of a set of refurbished buildings that once had some other use. In the case of the Troutdale location (McMenamins Edgefield), it used to be a “poor farm” (presumably from the days when being in debt was grounds for imprisonment, as the old “rules” posted refer to “inmates”), then later it was a nursing home. Their hotels typically feature a movie theater, a restaurant or two, a spa and a handful of places to get drunk either on beer, wine, cocktails — or all of them. This one distinguished itself by being the single best meal we had on this trip, out of at least 15 eaten out. The food was outstanding, as was their wine list. Alas, their martinis fell short. But nobody’s perfect. 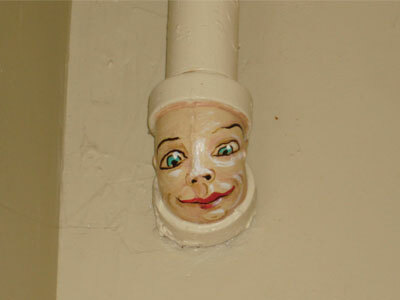 McMenamins is also known for its whimsical decor, the heart of which are elaborate (and ubiquitous) painted murals. After a night in Troutdale, it was on to Hood River. But not before a drive south to Mt. Hood. As we learned in Crater Lake, early June isn’t the time to visit Oregon if you want to see anything above about 5,000. 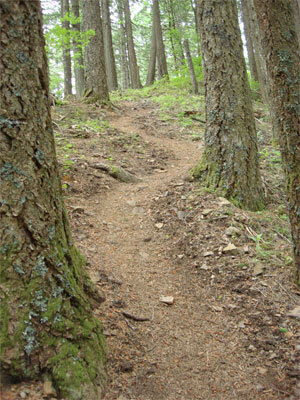 We had a couple of great hikes picked out to do around the base of Mt. Hood, but the local ranger’s office gave us the bad news: everything was still under many feet of snow. 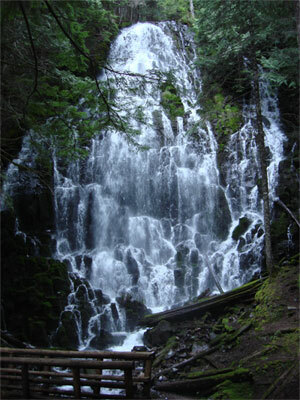 But they did offer us the Ramona Falls hike. It wasn’t the challenge we wanted, but it did provide a decent payoff. With Mt. Hood hiking a disappointment (and lesson for the future), we headed north to Hood River, where we’d booked a crappy little efficiency with what turned out to be a spectacular view of the Columbia River. 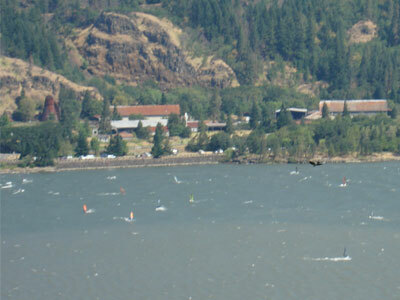 Interesting fact: Hood River is a mecca of sorts for wind surfers in the late spring and early summer. A constant winds blows eastward up the river and is apparently at its strongest around Hood River. Wind surfers come from all over the world to take advantage of perfect conditions. 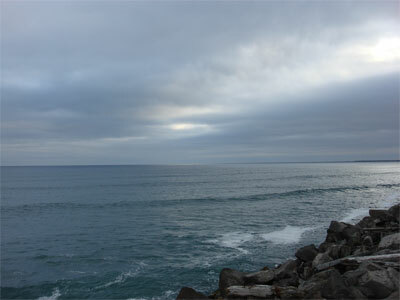 No matter how early we got up, if it was daylight, there were mad surfers out there. What you don't see were the outrageous stunts these people were doing in high winds -- full somersaults, taking flight or just screaming along the surface at top speed. Hood River was where we found our hiking nirvana. Jonathan felt reasonably recovered from the marathon 11 days before and I wanted to make some good use of my marathon training since my race was such a bust. So we looked at our hiking books and found not one but two hikes graded “difficult.” In doing some online research we further learned one (Mt. Defiance) was considered the toughest hike in Oregon, with the other (Starvation Ridge) a close second. We were in! 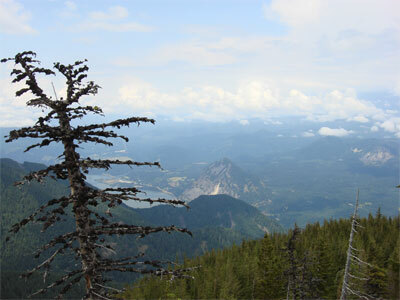 Starvation Ridge runs up the side of Mt. Defiance, so we decided to take that up, then try to ascend to the peak of Defiance, then go down the Mt. Defiance trail. The combined hike was predicted to be 10-11 hours. We did it in under 7. Booyah! Camp over night for an 8 mile hike? That’s for pussies! The reviews of these hikes were not joking. They were tough. Going up, Starvation Ridge started out as challenging (elevation gain via switchbacks) and then became very difficult, climbing nearly 3,800 feet in under 3 miles. That’s steep. We couldn’t go all the way to the top of Mt. Defiance because we lost the trail in the snow. But we were probably about .2 miles from the top. The way down was in some ways worse than the way up. It was steeper and shorter. We trashed our legs and, with the exception of the Steamtown race, my thighs were as destroyed as they’ve been after any marathon. We needed two days to recover until we could think about running again. This was fine, as we were next headed down the Columbia River to Astoria, the westernmost point on the Oregon coast and where river meets ocean. Astoria was another place we visited because we thought we should and, like Corvallis, immediately took to it. It’s a port town and a bit sprawling. There’s a broken-down quality to it, but full of charm. The place feels thrown together, which this picture illustrates. Check out the mix of houses and buildings: you’ve got Victorians, Craftsmen…and those weird 60s multicolored box houses. But somehow it works. We took a drive over the Astoria-Megler Bridge to Washington State, up the coast a bit to see where the river opens out into ocean. As with most of the stunning things to see on this trip, there was hardly anyone else around. Before taking off for Cannon Beach and the rest of the northern coast, we paid a visit to Fort Clatsop, where Lewis and Clark concluded their famous expedition and where there is a recreation of the soggy, dark and cramped log structure they shared with Sacagawea and family and about 12 men. Last, but not least, some snaps of Cannon Beach even though there are much better ones out there by professional photographers. 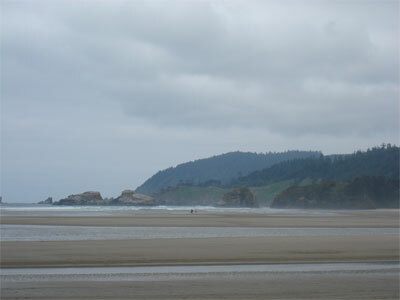 Cannon Beach goes on for miles, as do many of the beaches along the coast. 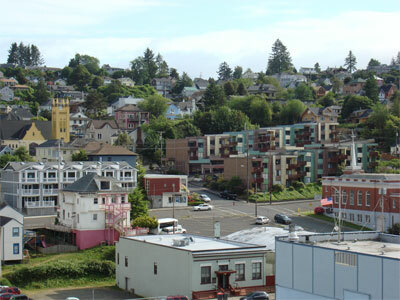 But it’s also a pretty town, as is its smaller sister to the south, Manzanita. Oh, to wake up every morning and go running on this beach. Like Bend, I took no photos of Portland. We were pretty exhausted by the time we got there and spent one day staggering around the Japanese Garden in a sleep-deprived state. The second day was spent driving all around Portland and its suburbs to check out the neighborhoods. I forgot I even had a camera. We did manage one fairly grueling run in Forest Park: a 9 mile run with 900 feet of elevation over rocky terrain. (We even spotted an Ethiopian runner.) Just when our legs were almost recovered from the Hood River hike, we whaled on them again in Portland. It was fine, though; the trip was over and it felt good to go out with a bang. I thought of you when I read this article on Bend, Oregon on the train. Yes, there was a lot of very vocal resentment of “outsiders” there — we stayed at a B&B and ate breakfast with a mix of out of towners and locals. One more reason not to like the place — petty infighting. Inflict waterfalls anytime, I love ’em! That shower pipe is uber cool. You’re back in rare form, the non-fat yogurt analogy was perfect. When we were visiting friends in Portland last year I ran a 20-miler in Forest Park – that was tough! That waterfall looks amazing. It must be just the right time of year for them. Thanks for the photos. I’d forgotten about the windsurfers on Hood River. That was some hike! Yes, Corvallis is a nice town – we had the biggest and best US sandwich ever at a cafe/micro-brewery. Good flat beach for running – perfect from July to September.